Vincent Rizzo focuses his practice in litigation at both the federal and state level, with a particular emphasis in the area of government law. Vincent has extensive experience representing public entities and governmental employees and has litigated countless cases to resolution. He successfully tried several federal civil jury trials to defense verdict and obtained multiple summary judgments. Vincent is involved in all phases of the litigation process and zealously advocates for his clients. Before joining Hinshaw, Vincent was an Assistant Corporation Counsel for the City of Chicago Department of Law for nearly five years. In that capacity, he represented the City of Chicago in municipal prosecutions, administrative appeals and litigation involving Section 1983 and Monell claims. During law school, Vincent was a public interest law intern for the Chicago Lawyers' Committee for Civil Rights and also interned for the general counsel of Accident Fund Insurance Company. In addition to his academic accomplishments, he was a teaching assistant for Legal Research, Writing and Advocacy; Torts; and Street Law. 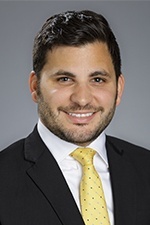 Vincent was also an active member of his law school's International Law Review and participated in the Commercial Arbitration Competition and the National Animal Law Appellate Moot Court Competition. Obtained not guilty jury verdicts in two Section 1983 cases on behalf of clients where plaintiff in both cases alleged excessive force, conspiracy and false arrest. Successfully argued for judgment as a matter of law in a jury trial on behalf of clients in a civil rights case. Obtained summary judgment on behalf of clients in a civil rights case arguing that their actions were objectively reasonable. Negotiated favorably low settlement on behalf of client in a wrongful death case. Obtained summary judgment on an unreasonable search claim on behalf of clients arguing that Plaintiff lacked a reasonable expectation of privacy and exigent circumstances existed. Received hundreds of favorable judgments at administrative hearings in matters relating to the public health, safety and welfare. Successfully argued for felony resentencing on behalf of client charged with armed robbery and home invasion reducing his sentence from 84 months to 76 months.